Turn challenges into opportunities and into tools that create a fulfilling life. Learn the key principles and tools that will help you overcome any obstacle in your personal and in your business life. When you put them to use, the odds are in your favour time and time again! Learn how to differentiate yourself from the rest of the pack. Identifying and analyzing the difference between competing and undercutting in the business world while staying true to your professional integrity. Thinking of starting a business? Is it for you? Learn what you really need to know to succeed before you start. This presentation is an exploratory introduction to entrepreneurship. A clear understanding of the different types of business set ups, the pros and cons. Determining the business models that are best suited for different personality types and goals. What makes some people stand out from the crowd while others go unnoticed? Your presence plays a key role in your personal and professional life. Learn how to use body language, mannerism, grooming and wardrobe psychology techniques that will help you be more influential and approachable. No matter how great your services or products are, if no one is aware of them, they are worthless. Give your business the personality and the key elements that make your business irresistible. Simple and effective strategies that bring in new customers and keep your current customers coming back for more. Request Francesca to speak at your upcoming event. ​"A dynamic speaker who has the ability to engage her audience and inspire them to make changes in their life and their business. She is an example of what is possible and is an example of the success she helps others to achieve." - Lynn Robinson, CEO The Robinson Group Training and Consulting Corp.
"Ms. Francesca Anastasi spoke authentically, eloquently and enthusiastically to my members. The title of her presentation was “Discover 5 novel ways to stand out from your competitors.” Francesca totally engaged the audience with her stories and examples and the depth and breadth of her knowledge around all things related to differentiation. She opened many eyes to the power of simple tools to elevate our ability to stand out from our competitors. My members simply loved her." "A dynamic, engaging, sincere and often humorous speaker who can make even a large group feel intimately connected. 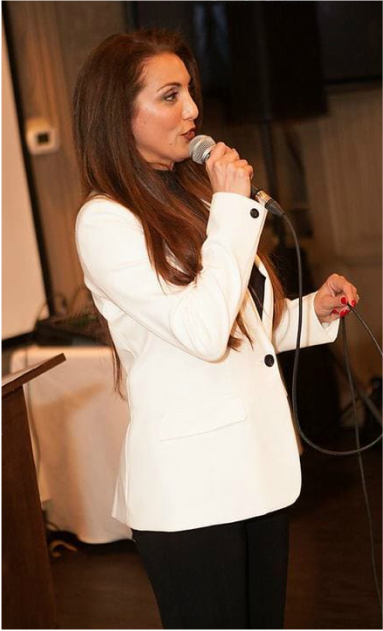 I encourage anyone looking for an inspiring woman keynote speaker to contact Francesca. She is an amazing woman, speaker, and philanthropist!" "Her commitment to empower women everywhere shines through Francesca Anastasi’s energetic and creative personality. She is one of those rare finds that leave an everlasting positive impression on your life. I have never met a more genuine and sincere leader dedicated to inspiring everyone to achieve their dreams." "Francesca’s presentation really had me captivated. She has a wonderful ability to blend scientific facts with real-world examples and personal stories to appeal to all types of learners. She has influence and stage presence coupled with personal charisma and a genuine heart, which leaves her audience feeling both served and shifted for the better." - Michela Quilici “Business Navigator” MQ Consulting and Business Training, Inc.
"She is one amazing woman who is inspiring, enthusiastic and heart centered. It has been a pleasure to have met her and have her speak at our network meeting. I look forward to seeing another presentation by Francesca." ﻿"Francesca was one of our speakers at The Tri-City Women's Conference a few years ago and did an amazing job not only in just speaking to the audience about her life story but by further inspiring them with the gift of dance - which is not only her passion - but was ultimately the catalyst that empowered her to find the inner strength she needed to overcome earlier life challenges that would test her self-esteem. By sharing her story Francesca gave a rare gift to women that day you don't always find in speakers: true authenticity and empowerment. She is an inspiration and glows from within!"